The National Black MBA Association® will host its 38th Annual National Conference & Expo in New Orleans this year. 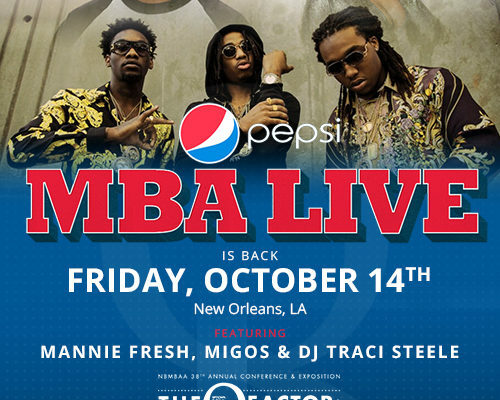 A partnership with Pepsi will deliver an amplified lifestyle component that will combine the traditional Friday Night Concert and MBA Live® After Party into one mega event for a world-class entertainment experience. Attendees will be treated to a night of dancing, fun and surprises courtesy of a line-up of top-talent. Featured performers will include: Multi-platinum recording artist Mannie Fresh, MIGOS and DJ Traci Steele. Read the full article.